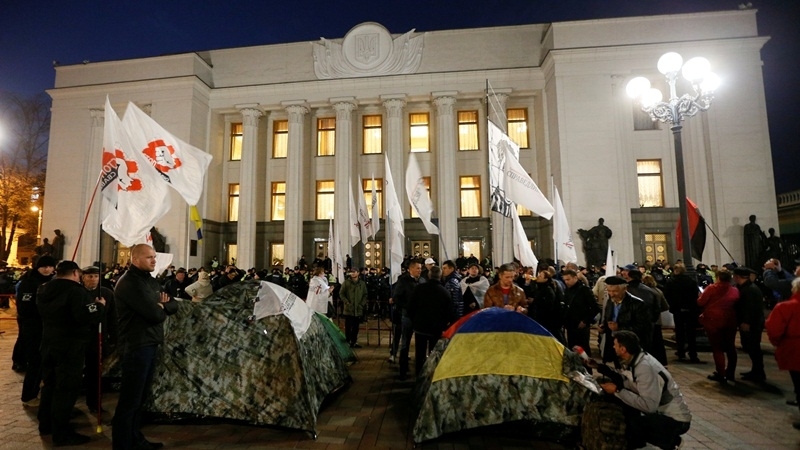 An indefinite protest began outside Verkhovna Rada, the building of Ukrainian Parliament, on October 17. The participants demand the authorities to cancel the immunity of the deputies, amend the electoral legislation and create an Anti-Corruption Court. The action was organized by the parties "Samopomich" (Selfhelp), "Fatherland", "Movement of New Forces", "5.10", "Svoboda", "National Corps", and "Right Sector". The meeting between Poroshenko and a group of people's deputies who participated in the rally outside the building of Ukrainian Parliament did not take place, MP Mustafa Nayem reported. “The President refused to meet with representatives of the action Big political reform. Svetlana Zalishchuk, Sergey Leshchenko, Yuri Levchenko and Yuri Derevyanko came along with me. The President decided that he wanted to meet only a part of our group (except Levchenko and Derevianko), which is unacceptable for us. Nevertheless, the President already knows the purpose we came for," the MP (fraction "Petro Poroshenko Bloc"), participant of the protest action outside the Verkhovna Rada Mustafa Nayem wrote on his Facebook page on Wednesday evening. In the evening on October 18, the clashes between the protesters and the police occurred near the tent camp of protesters outside the Verkhovna Rada. Law enforcement officers used tear gas.